The second Republican debate happens tonight with the early round starting at 6pm ET (3pm PT) for the candidates outside the top ten. Since Rick Perry dropped out last week, that leaves only four candidates in the “happy hour” early broadcast of candidates outside the top ten. 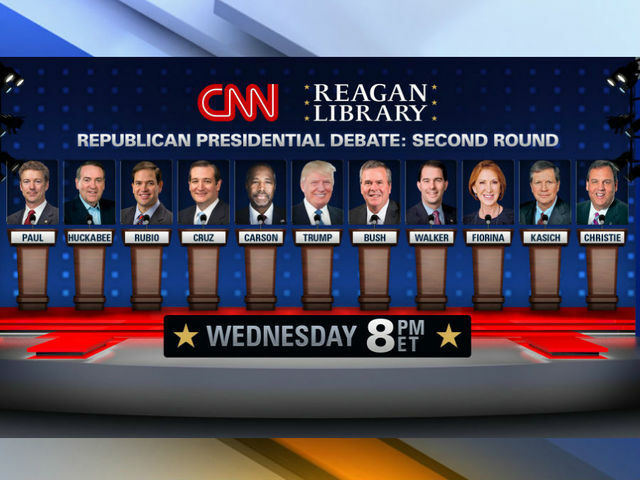 CNN is billing the primetime debate as “round 2” for the Republicans and the main show begins at 8pm ET (5pm PT) with eleven candidates including Carly Fiorina. No one has more on the line in Wednesday night’s Republican presidential debate than Jeb Bush. The former Florida governor with one of the most recognizable names in politics and $100 million in the bank is facing one of the most crucial moments of his political career at the CNN debate held at the Reagan Library. In the unpredictable GOP race for president, Bush is struggling to regain his footing in the midst of Hurricane Trump. He first tried to ignore the bellicose billionaire before changing course and punching back hard. He has released detailed tax and immigration reform plans to show he is about substance, not style. He has kept a rigorous pace on the campaign trail, squeezing in Monday meetings with tech leaders in Seattle before heading off to Nevada and Michigan post-debate. The payoff for all that hard work? A steady slide to the middle of the pack that is giving Bush donors the jitters and an opening to rivals like Ben Carson and Ohio Gov. John Kasich to overtake him in key early-voting states. Jeb is on the verge of being overtaken by someone like John Kasich who has similar views and a similar personality but lacks the name “Bush” as a point of concern. If Jeb does not break away tonight and illustrate that he will be a solid campaigner and be able to fight it out through the primaries, he’s sitting on some shaky ground with donors and the poll numbers. All the being said, this is only the second of many more Republican debates in coming months so it may not be the end game even if he falls short. Scott Walker is also on the brink of slipping further down the polling ladder and I’m not sure he’ll be able to reverse that trend with the current state of the race. Donald Trump may become a punching bag which may, in the end, help him if he’s being attacked by everyone as it did during the August 6 debate. Ben Carson is walking a line of attacking Trump without shedding the “nice guy” image he’s cultivated over the course of the campaign. He’s got to come out strong yet tempered and I’m sure he’ll find a way to pull that off unless he makes some major missteps. Also to note, the live stream will be free from CNN tonight, no login or cable/satellite account required to watch the debates live. Sorry, my fault. No offense intended by not mentioning him. I just didn’t think he has a lot to lose or gain tonight. He always delivers solid performances but he’s being overshadowed by Trump at the moment, in my opinion. Will the video be available to watch after the debates? I’ll do my best to find and post it tonight, hopefully by midnight if it pops up by then. There will be a new post for it and links everywhere. The link you provided says that it is a limited stream, and that you have to log in to actually see the entire debate. I misunderstood what I was seeing. I think they’re showing that during the commercial breaks. Not working for me. Keeps telling me I have to sign in and that it is just a limited preview. Bummer! People keep saying CCN is allowing free lifestream watching without cable account. But it is NOT true. AT least on Fox Debate, I found another lifestream source and was able to watch most of it. It is ridiculous for these debates not to provide free livestream — available to ALL including overseas. What about thousands (or millions) of US Citizens working overseas who want to be able to hear from all the candidates too? I was able to get the CNN debate with no problem (except a minor issue with my own computer at first!). I was not able to get ANY of the fox debate, because if you don’t have cable, you were banned from it. Brad, just a memo. Do not spam the same comment across multiple posts or they’ll be deleted. Discuss the topic at hand, thanks. They must be giving us a fake phone number! By the way, Brad, “Watson” has six letters, too.